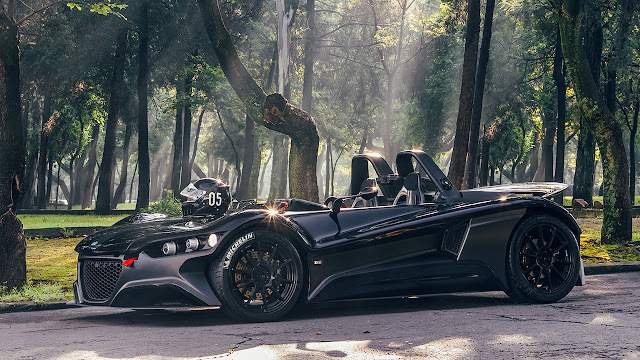 The VUHL 05 lightweight supercar will make its debut in the capital at the London Motor Show, to be staged in Battersea Park between the 5th and 8th of May. The Mexican designed and produced newcomer was first seen in the UK at the 2013 Goodwood Festival of Speed and has been on general sale here since late last year via specialist dealer Bespoke Performance (www.bespokeperformance.co.uk). Its attendance at the London Motor Show will kick-start a packed global programme for this exciting new marque. The VUHL 05 (VUHL stands for vehicles of ultra-lightweight and high performance) is powered by Ford’s award-winning turbocharged 2-litre EcoBoost engine, which is sufficiently potent to endow the two-seater with a mighty impressive power-to-weight ratio of 410 bhp/ton. Forty percent of the car’s components are sourced here in the UK, where the car is priced from £59,995, and it will be a featured model at the London Motor Show, which has media support from the Telegraph, Auto Express and Motor Trader magazine. The London show promises visitors the motoring excitement enjoyed by the other European motor shows and will include outside demonstrations and visitors will be able to road test the car or cars of their choice as well as being able to purchase a new car.